You can find beauty in all things. You can find it in your mistakes. After all, they’re really just happy accidents. You can find beauty in nature—you know, the place where all of those happy little trees live. You can find it in the fluffy clouds or in the fluffy hair of Bob Ross, because we all know that his perm is a national treasure! 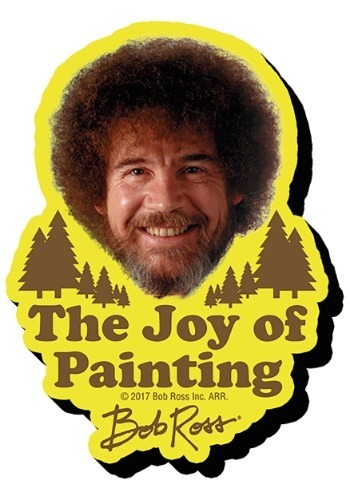 You can even find it on the side of your fridge when you have this inspiring Bob Ross: The Joy of Painting Funky Chunky Magnet (whew, that’s a mouthful, isn’t it?). Yes, this Bob Ross magnet is beautiful, mostly because it features the artist’s magnificent permed hair on the front. It also has plenty of happy little trees and “The Joy of Painting” proudly displayed on the front. You can place it on your refrigerator to remind you of all the beauty in the world, or you can just gaze into Bob’s calming eyes as you decide what snack to eat. This Bob Ross magnet is great for painters, chill people, or anyone who needs a little reminder that we don’t make mistakes. We just have happy accidents in life!